On Friday September 30, I hiked into the Buck Creek Fire area, inside of the Glacier Peak Wilderness Area. Buck Creek is reached at the end of Chiwawa River Road, near Trinity, a former mining town. Buck Creek Fire ignited from lightning on July 22nd and is still burning. This is a fire that was never suppressed. The Forest Service made a wise decision in letting it do it's thing, while protecting Trinity, and planning a contingency should the fire burn outside of the wilderness. The Buck Creek Trail is officially closed and for good reason. I had obtained permission, and felt privileged. I had to be very careful as there are a great many charred trees hanging by a thread and ready to fall. This is what I would call a good fire. There are no really large areas left treeless. Burned areas are intermingled with patches of untouched vegetation. The fire has made Buck Creek area more interesting, and more ecologically diverse. I will write more later in an article. Thanks to Cary Stock and Jeff Rivera of Wenatchee River R.D. for letting me in! Fire and avalanche have both left their mark on Phelps Ridge. Bridge over the Chiwawa River wrapped for protection. This material is much heavier than ordinary aluminum foil. Black mixed with green is the norm for the Buck Creek Fire. The trail can be seen at right. The orange-brown bushes are huckleberry. They will send new shoots up next summer. Most of the fire was mixed severity. I think the scorched trees seen here are pacific silver firs. I saw quite a few woodpeckers. The dead trees will turn into beautiful silvered snags. The white ash marks areas where the fire burned deep into the soil. Mixed in are pockets that were only lightly touched. The fire is still going, and could potentially burn beneath the snow over winter. Here the fire is creeping slowly and mainly burning underground in humus and logs. Dr. Paul Hessburg would call this a "skunking around fire". I photographed this western toad right in the trail, in an area not burned. This hole in the ground is big enough to bury a volkswagen beetle. The trail can be seen at right. The ground was very loose and ready to cave in. As to the origin of the hole, my only theory is that this section of trail is an old mining road, and the miners used stumps for fill. Keystone Point is a prominent landmark overlooking the Columbia River, Waterville Plateau, and the Entiat Valley. To get there is to drive up through Mills Canyon, a drainage that burned out in the 1988 Dinkelmann Fire, and again in the 2014 Mills Canyon Fire. My first trip to Keystone Point was in 2011, as part of a project to repeat historic panoramic photographs for the U.S. Forest Service. Out of curiosity I returned to Keystone Point to produce an update. Mills Canyon is not for everyone. The pavement quickly ends and turns into a steep, narrow, double-grip road. There are no guard-rails and going off the side would likely be fatal. It would make a great motorcycle ride or mountain bike ride for the super-fit. The beauty of Mills Canyon is you can see a long ways, the flowers in spring are abundant, and in fall there is nice color. Other than in deer season, a person is likely to have Mills Canyon to themselves. I have only once encountered another vehicle. On my most recent trip I did find a few Kokanee and Keystone Light beer cans, an indication of who does visit. To my way of thinking driving the roads out there with a beer in hand is pretty foolish. My comparison photograph turned out particularly well, because the day was clear and the time of the year was a close match with the original image taken on October 2, 1935. I learned something about photography through this project. My whole career, I have avoided middle of the day photos in full sun. Well in this case, I actually got the best match with the original panorama by recording the scene in late morning, close to noon. Without duplicating the shadows in the same way, the two scenes are hardly recognizable. In the nineteen thirties there was a wide expanse of forest. That is all gone now. To read the article on fire and recovery in Mills Canyon click the link at end of this blog entry. The foliage of wild rose, spiraea and fireweed paints the slopes orange in Mills Canyon . Bitter cherry and Douglas-maple supply a nice contrasting yellow. Whittled away by the fire of 2014, a Douglas-fir snag creates a halloween-like appearance. The berries of bitter cherry must appeal to robins, as there was a flock of them feeding. The road on the ridgeline separating Mills Canyon from Spencer Canyon leading to Keystone Point. The willows behind me have grown tremendously in the two years since the Mills Canyon Fire of 2014. Behind me are some of the few remaining large ponderosa pines. The Table Mountain Fires started on September 8, 2012 and burned 43,312 acres. Most of the area burned was high elevation forest that experiences fire infrequently. Trees in the area are lodgepole pine, Engelmann spruce, subalpine fir, and western larch. There is the occasional ponderosa pine or Douglas-fir. I put some photo points into the Naneum Meadows area at the 5,300 foot level in 2013. Here are some results at the end of the fourth growing season. This area is near Blewett Pass on the Cle Elum Ranger District of the Okanogan-Wenatchee National Forest in Washington State. NNMW-6 was taken as a composite panorama using a 45mm Tilt/Shift lens. Here you can compare the image I took on June 18, 2013 with the one I did on September 7, 2016. The log is Engelmann spruce. The predominant plant in the 2016 photo is a species of willow. Fireweed is also abundant. There are many lodgepole pine seedlings hidden among the taller plants. This is a wet area where the fire did not burn real hot. NNMW-4 September 7, 2016. Fireweed and willow are abundant. Lodgepole pine seedlings can be seen, as a darker shade of green. NNMW-8 June 8, 2013 This is a site that burned long and hot. The duff layer has all been burned away and there is nothing left but ash and mineral soil. Nutrients have been lost. NNMW-8 September 7, 2016. This site is showing surprising resilience. Plants besides the lodgepole pine seedlings include pearly everlasting, willow, gooseberry, fireweed, and canadian thistle. NNMW-7-1 June 18, 2013. Sometimes the heat of a fire is largely in the crowns of the trees and at ground level there is light burning. 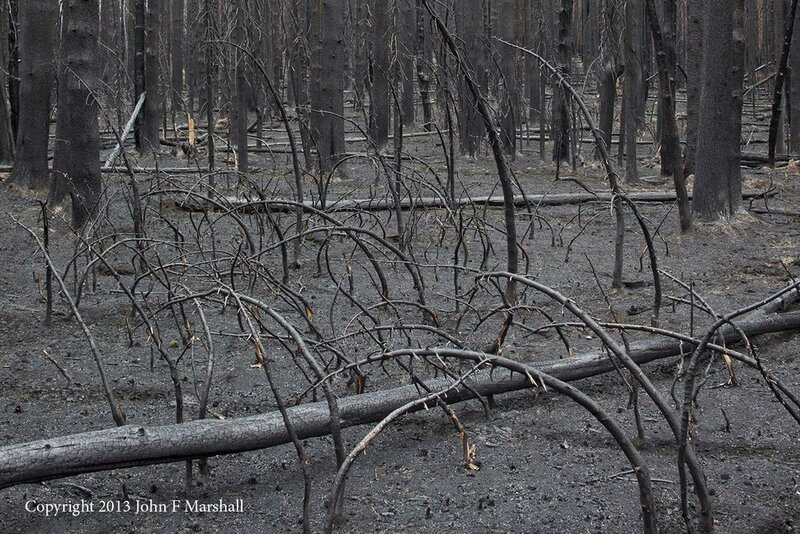 Seen here are scorched subalpine fir saplings. The dead trees are all lodgepole pine. NNMW-7-1 September 7, 2016. The scorched sapling subalpine firs have surprised me with their resilience. Lodgepole pine seedlings were established from seed dropped from serotinous cones at the time of the fire in 2013. Lodgepole pine has cones that open the year they are formed, and others held together by resins and referred to as serotinous. Serotinous cones open when there is enough heat to melt the resins, spilling seeds on to the ground. Four years have passed since the Naneum Meadows area burned. The progeny from years of stored up lodgepole pine cones can be seen here. I did not see seedlings of any other tree species. Lodgepole pine stands are known to produce up to 320,000 seeds per acre! Scattered mature western larch trees survived Table Mountain Fire in 2012. I was hoping to see larch seedlings, but found none even under the trees. Apparently larch does not reliably produce cones every year. The larch has been outdone by lodgepole pine. If a re-burn occurs before the lodgepole pines have produced a significant number of cones, then larch has a chance at being the predominant tree in the area. The north side of Mt. Hood burned in the 6,304 acre Dollar Lake Fire of 2011. This area is normally too wet to have large fires. Fire had not visited many places for several hundred years, so this was a big turning point in time. I hiked in on trail 631 in August of 2012 to explore the burn. This July I was able to return to some of the sites. I was hoping to pick huckleberries, which was not the case. There were many plants that had come back from the roots, but there were few berries. I am not sure whether the crop was frost-killed or the plants are putting their energy into growing instead of reproducing. The trail up to the Wilderness boundary was brushed out and easy to travel. After that there were logs every one hundred feet to one hundred yards. With Forest Service budgets what they are and the requirement that only hand tools be used, it is no wonder. Oberon, our Catahoula Hound Dog puppy was a great addition to the trip. Nine months old in this picture he carried a light load. He did great at negotiating all of the logs in the trail. He was very willing to put on the pack, and did not try to take it off. Good Boy!! Living at the edge of a meadow, these two Douglas-fir trees survived the fire. Remnant trees are important in re-seeding the forest. There were lots of huckleberry bushes, but almost no berries. On the south side of Mt. Hood there was excellent picking this year. Perhaps the plants are putting their energy into growth? Pearly everlasting was an abundant flower in drier areas. Golden chinquapin, Chrysolepis chrysophyllais is the champion shrub growing on aspects that tilt to the south. In 2012, I mistakenly indentified it as rhododendron, which has similar leaves and a similar growth form. These plants did not establish from seed, but rather grew back from roots that survived in the fire. Now that I see the fruits of this plant, there is no mistaking it for rhododendron. There are nuts inside of these burs. A typical stretch of the trail. Willow, fireweed, and beargrass are the predominant plants. In late June I took two trips to the Loup Loup Summit area. I had a mission- to re-take historic panoramic photos from 1934, at Buck Mountain Look-out, for Washington State Department of Natural Resources- the DNR. On the first trip I took too many dead end roads, ran out of time and instead of getting up to Buck Mountain, stopped along the highway west of Loup Loup Summit, for the spectacular displays of lupine. The lupine had come up in the area burned two years earlier in Carlton Complex Fire. On my second trip, I still had trouble navigating, and ended up at a lovely little lake in section 20. I finally got on the right road, but nearly did not make it up to the look-out due to the massive boulders and slabs of exposed rock. I should have taken my gas-guzzling Tundra instead of my moderately gas-thirsty RAV-4. Buck Mountain Look-out nearly burned up in the Beaver Lake Fire in 2015. The Beaver Lake fire was part of massive Okanogan-Complex Fire, the largest fire in Washington state history. Fortunately firefighters were able to save the historic structure. I would like to hear their stories. Buck Mountain Look-out started as a crow's nest in 1919. A pole tower was built in 1934, and the present structure was built in 1961. It is occasionally manned. Stand replacement fire- where all of the trees are killed, is the norm in the kind of high elevation forest that is around Buck Mountain. Most of the trees are lodgepole pine, with some Engelmann spruce, and subalpine fir. The big difference in modern fire compared with earlier times is the sheer extent of high intensity fires. Visiting a year after the fire, green-up was starting on the south facing slopes (south aspects). I saw numerous snowshoe hares and mountain bluebirds, and also one deer and one grouse. I look forward to returning in a year or two to re-take some photos. This area on the Loup Loup State Forest, east of Twisp, and west of Okanogan is well worth visiting. Here is the photo comparison. Thanks to Washington Department of Natural Resources and Wenatchee Forestry Sciences Lab for supporting this project! Insects don't create art, or do they? Egg galleries made by Douglas-fir beetles (Dendroctonus pseudotsugae). I found these patterns on the underside of some bark from a large Douglas-fir tree. The tree was injured by the fire, and finished off by the bark beetles.